Surreal beauty. Looking of the NW side of Nanuya LaiLai to Nacula's SouthEast tip. Fiji, Yasawas. After enjoying Yasawas “other” Blue Lagoon (off nearby Nacula) for fivedays, we were pretty much on our way out when we arrived at the Blue Lagoon (off Nanuya LaiLai). We’ve heard there’s lots of great snorkel spots in the area, but we didn’t know where and were hankering to give our legs a stretch and maybe try again to enjoy a tea house, as on Nacula didn’t really work out for us. It’s a small island, so hiking to the other side is a moderately short hike, easily done in less than an hour. 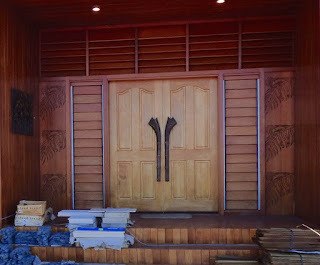 Nice doors on Nanuya LaiLai Island Resort, Fiji, Yasawas. Our first stop was at Nanuya Island Resort, which even has a squeaky-clean, air-conditioned little grocery store. 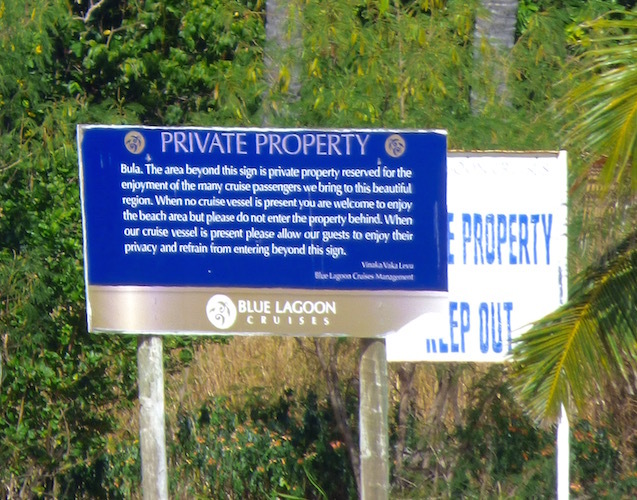 If your needs are basic and price is no object, it’s not a bad stop and the folks in the resort are quite pleasant. 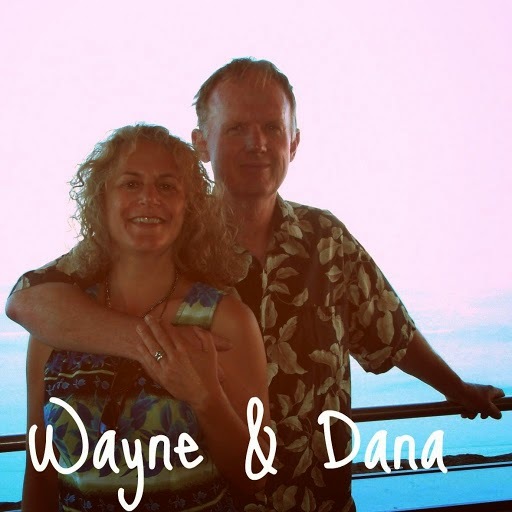 We asked where to find the trail to the other side of the was, and with a smile, they said, “Just follow the road... up.” There is after all, only one road, and that’s for a very short stretch at that, obviously built to keep the resort running smoothly. One of two large bank of solar panels at Nanuya LaiLai Island Resort. 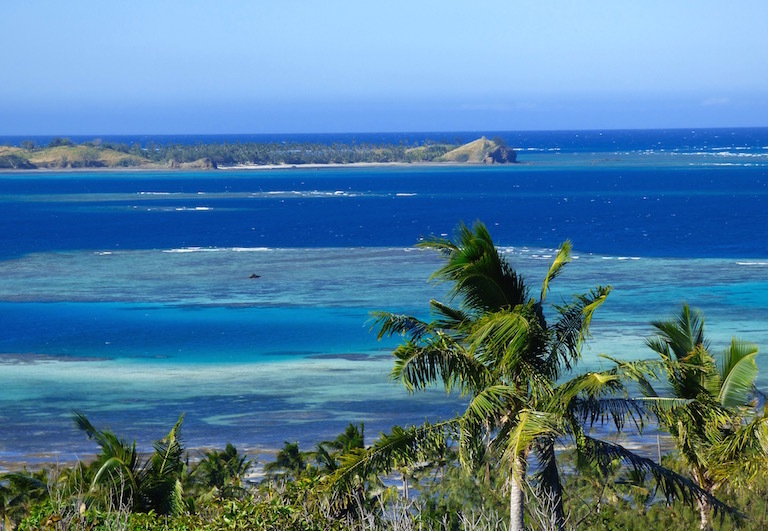 Fiji, Yasawas. We wondered who was going to harvest the well-laid out, thriving plantation that filled much of the resort’s open hillside between units… cassava, bananas, papayas and much more. We were impressed with the quality of construction and design, still underway. A hilltop gazebo overlooking the water had just been finished only a few weeks prior. 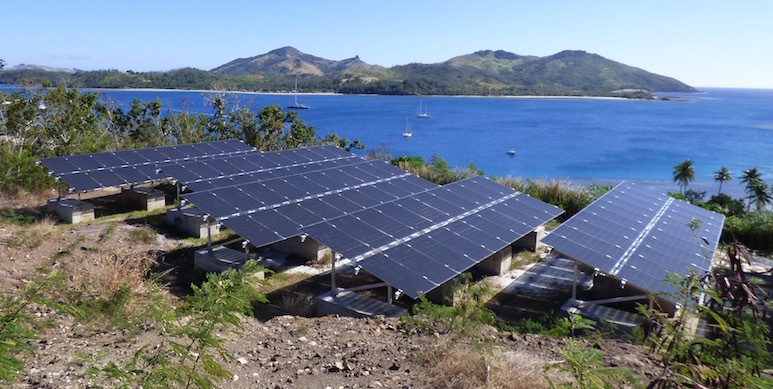 There were several impressive solar panel arrays – brilliant for these dry, sunny islands. 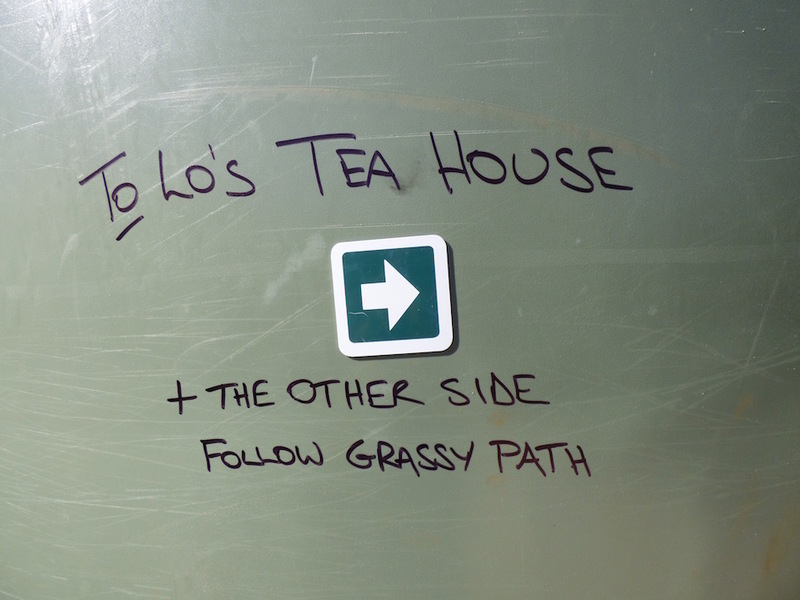 Lo’s Tea House cleverly took advantage of the water tanks to felt-tip in an arrow at the road’s end directing walker to their site; we complied. Nanuya LaiLai's reefy SE shore. Fiji, Yasawas. The ridgetop trail provided a palm-fringed fabulous view of the beautiful mostly reefy stretch between Nanuya LaiLai and Nacula. I’m not even sure we’d consider taking a dinghy through that stretch! We figure it would take a local to thread that stretch of water. Nanuya LaiLai's lowlands. Fiji, Yasawas. Closer view of the bay fringing Nanuya LaiLai's lowlands. Approaching Lo’s Tea House, Nanuya LaiLai’s dry hills gave way to village plantations, which offered some brief patches of welcome shade. The solid green lowlands to the Northwest looked impenetrable. Mangrove? Jungle? Maybe both. on Nanuya LaiLai. 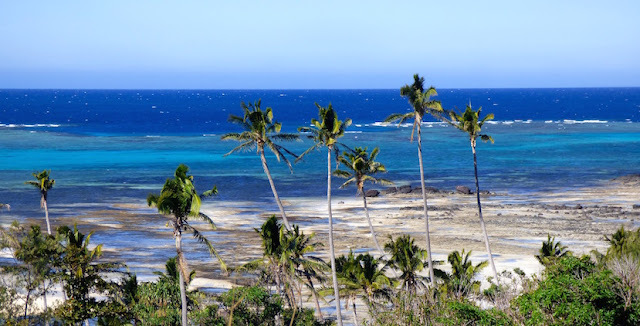 Fiji, Yasawas. 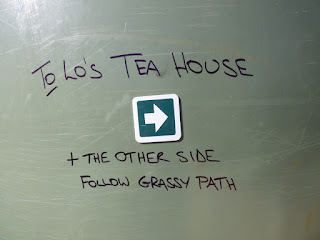 We came upon a village, where we think we arrived at Lo’s Tea House. The only person about was a fellow working on a rooftop down the hill; he didn’t see us. For those visiting Nanuya LaiLai… Sunday is not a good day to visit the Lo’s Tea House! Not that surprising, really; many Fijians dedicate Sunday to church, family and rest. We tried a different path back, taking a fork off the trail that looked like it would drop down to the beach near our boat. 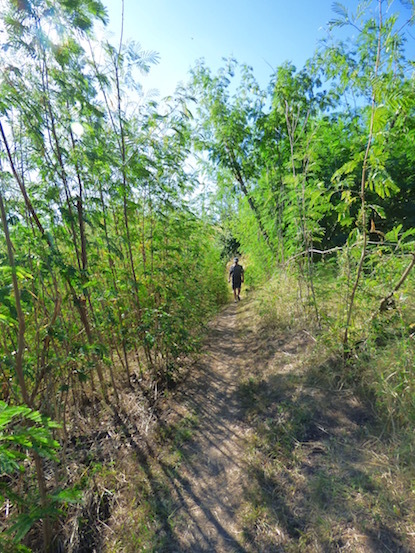 Wayne passes by cassava plants on Nanuya LaiLai. Fiji, Yasawas. 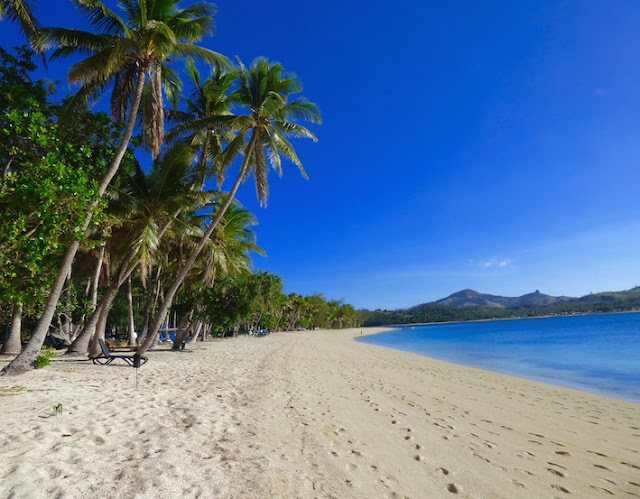 We passed under some lush, tall mango trees on the way down, coming out to a broad, nicely appointed picnic area, facing out to a powdery white sand beach. 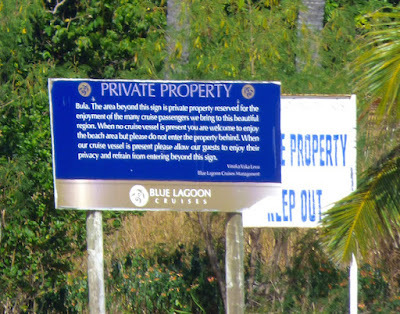 We figured out it was where Blue Lagoon Cruises takes its passengers, seeing the “Passengers only” sign after we passed through that restricted area. The entire hike, we so no one else on the trail or in the Blue Lagoon Cruises “passenger only” area, so we weren’t too worried about it. Sweet beach! Fijis Yasawas Nanyua LaiLai. All in all, a great way to while a way a bit of the afternoon. 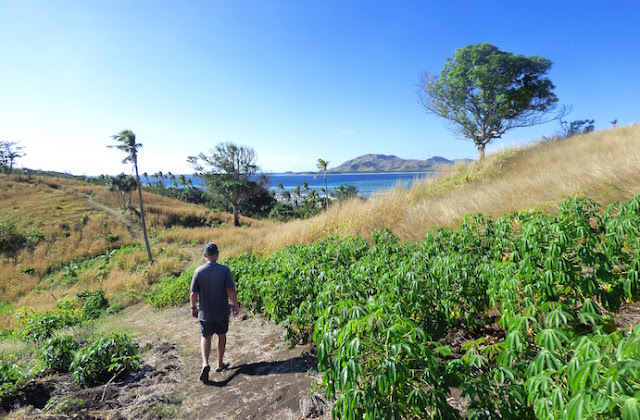 If we make it back to Fiji, we’d like to explore the surrounding Blue Lagoon islands by dinghy and snorkel, even if it’s Sunday and there’s no Lo Tea for me (apologies to Seinfeld and the SoupNazi). shouldn't have gone. Fiji, Yasawas. Location LocationThis recent retrospective was from a month ago, July 24, 2016, when we anchored off Blue Lagoon, Yasawas Nanuya LaiLai (S16.56.589 E177.22.052). 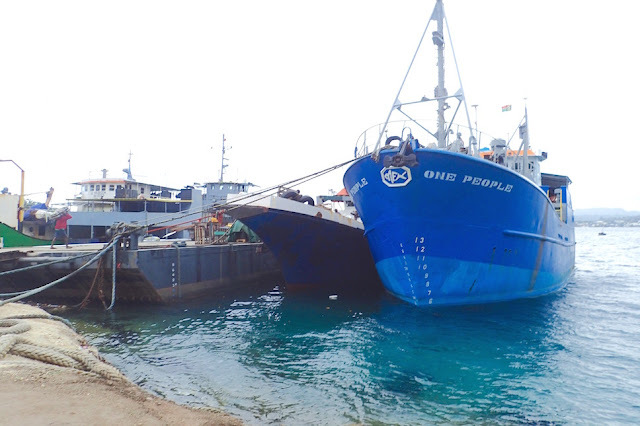 We are currently moored off Vanuatu's Port Vila, Yachting World Marina, (S17.44.722 E168.18.726) though by the time you read this, we’ll likely be underway to Ambryn, hopefully in time to catch their Back to My Roots festival. There's still some Fiji catch-up posts coming, but seemed since we've been in Vanuatu for a couple weeks now, it was time for more than just an "arrived!" post here.